On 24 October 2016, the Chinese Ambassador to the UK H.E. 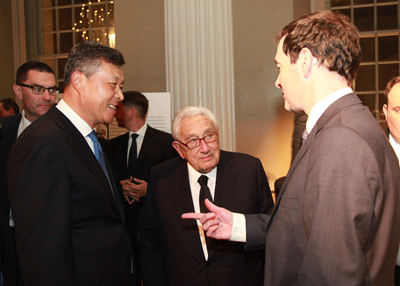 Liu Xiaoming attended a dinner party for what would have been the 100th birthday of Sir Edward Heath. The dinner party at the Banqueting House, Whitehall was hosted by the Heath Foundation, a philanthropic institution named after the former British Prime Minister to manage his heritage. Former US Secretary of State Dr. Henry Kissinger gave the keynote speech at the dinner presided over by former British Prime Minister Sir John Major. More than 200 people from all walks of life including the British government, parliament and business were present. The evening began with a review by Sir John Major of the political and life achievements of Edward Heath. Among others, he spoke highly of the establishment of ambassadorial-level diplomatic relations between the UK and China during Sir Edward's office. Sir Edward had been committed to promoting UK-China relations and friendship, having visited China many times after he stepped down as Prime Minister. Dr. Kissinger reviewed the historical process from opening the door to rapprochement between the United States and China to the normalization of relations. Improving US-China relations was one of the greatest achievements of President Richard Nixon, he said. He also commended the outstanding political foresight of Edward Heath in recognizing the importance of China as well as relations with China and facilitating the normalization of UK-China relations. 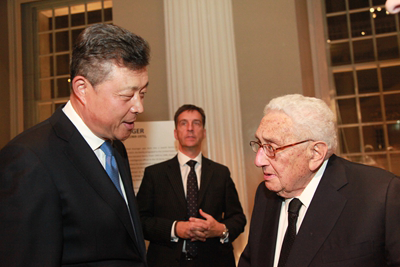 At the dinner party, Ambassador Liu Xiaoming talked with Dr. Kissinger. He appreciated the important contribution of Edward Heath to China-UK ties and thanked Dr. Kissinger for his continuous efforts in promoting China-US relations. Dr. Kissinger said he and Heath had a lot in common, of which one very important commonality was that both of them had been friends of the Chinese people and committed to developing friendly cooperative relationship with China. He expressed the hope to see continuous development of UK-China and US-China relations. 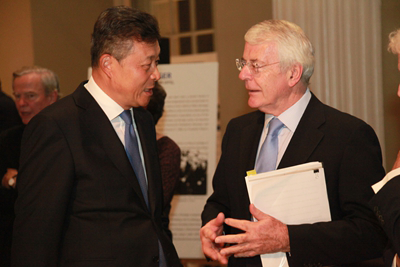 Ambassador Liu also talked with Sir John Major and George Osborne, former First Secretary of State of the UK, and exchanged views with them on China-UK relations and other topics.